Global stocks, US equity futures and Treasury yields extended gains while the dollar slumped as "risk-on" sentiment returned after the U.S. and China exchanged trade proposals meant to avoid an escalation of economic tensions, while European bonds declined and the euro strengthened following a Bloomberg report and hawkish comments from ECB speakers suggesting that the ECB's next, June 14 meeting will be "live" to debate the end of QE. ... could dampen broader bullish sentiment with Europe's Stoxx 600 Index rising led by energy, miners and materials stocks, though it faced a headwind as the common currency rose for a third day, hitting the highest level since May 23, amid a short squeeze prompted by a Bloomberg report that the ECB may announce the end of QE next week, while ECB chief economist Peter Praet on Wednesday confirmed that next week’s gathering will be pivotal for reaching a decision on when to end the institution’s bond-buying program. ECB's Praet (Dovish) said inflation expectations are increasingly consistent with their aim, post QE forward guidance on policy rates will then have to be further specified. He further added that markets are expecting an end of QE at end of 2018, this is an observation and input that is up for discussion and that it is clear that next week will need to discuss end of QE program. ECB's Weidmann (Hawk) said that inflation is now expected to gradually return to levels compatible with their target, adding that market expectation of end of QE by end of 2018 is plausible. ECB's Knot (Hawk) said it is reasonable to end QE soon inflation outlook is stable and less dependent on stimulus. He adds that the ECB should wind down QE as soon as possible. Perhaps the take home message here is that as Bloomberg's Lisa Abramowicz said, "it's kind of amazing that the ECB has to spend so much time deciding whether or not to even talk about exiting its bond-buying program." Still, not all was well as Italy's FTSE MIB slumped -1.0%, weighed on by Italian banks (-1.6%) following Conte setting Italy on a collision course with the EU Tuesday, even though analyst comments pushed the narrative that for now Italy's problem is not Europe's problem: "The problems in Italy are only Italy’s problem again,” said Commerzbank's Esther Reichelt. "For the euro there is a small but significant difference between a crisis in a member state that euro investors can avoid by shifting their portfolios to a different euro zone country and a systemic crisis of the single currency." Earlier the MSCI Asia Pacific Index climbed after China was said to offer to buy more American products and on reports the U.S. Treasury Department favors less sweeping investment limits on the Asian nation. The U.S. and China continued to discuss the shape of a deal to fend off an impending trade war, with China offering to boost purchases of American goods and the U.S. finalizing a deal to allow China’s ZTE to resume purchases from American suppliers. “European markets will remain focused on the latest chapter of the political development, which covers the subject of trade tariffs given that we do not have any significant data on the agenda today,” said Naeem Aslam, chief market analyst at TF Global Markets U.K. Meanwhile, trade "has an impact on sentiment, but doesn’t necessarily have an impact on the broader fundamentals," Dwyfor Evans, head of Asia-Pacific macro strategy and managing director at State Street Global Markets, told Bloomberg Television, perhaps explaining why good trade news are bullish while bad trade news are ignored. "Looking at the fundamentals alone, it’s not a bad environment for global markets, it’s just getting pushed from one side to the next by headlines and politics and volatility right now." Traders are also looking ahead to the G-7 (or rather G-6 +1) meeting later this week for further developments in the trade story. In macro, the dollar fell against most of its peers ahead of U.S. economic data, and as Treasury yields snapped as high as 2.96% the day after Gartman closed his TSY short. Government bonds across the euro zone fell, led by the slide in Italian securities. The euro climbed on ECB news and the pound was helped by the weaker dollar and the U.K. opposition party’s softening Brexit stance. Australia’s dollar strengthened against all its 31 major peers after first-quarter economic growth beat forecasts. The yen weakened as gains in Asian stocks reduced demand for haven assets; USD/CHF edged higher even as Swiss inflation accelerated to the fastest since early 2011 in May. In Emerging Markets, investors will be closely watching Brazilian assets after the real closed at the lowest since 2016 following a failed attempt by the central bank to halt the currency’s slide. In the latest Brexit news, UK opposition Labour party are reportedly going to announce a major shift towards a soft Brexit, in which party leader Corbyn will table "internal market" amendment to the withdrawal bill, customs bill and trade bill. UK Brexit Secretary David Davis is "not backing down" in dislike of elements of the backstop plan, according to The Times. In commodities, oil prices were mixed as prices come off recent highs after nursing recent losses with overnight gains post-API, which showed a larger than expected draw in crude stockpiles. Nonetheless, the inventory report pressured RBOB after a significant build in gasoline stockpiles, although this was then gradually pared throughout the session. Overnight Russia’s Energy Minister Novak reiterated OPEC+ countries should consider a possible easing of oil output restrictions depending on demand conditions. In metals, gold is trading marginally lower albeit still rangebound and currently testing USD 1295/oz to the downside. Meanwhile, Chinese iron ore futures rose to 2-week highs amid an explosion on Tuesday at an iron ore mine in China’s north-eastern province of Liaoning. China’s central bank stepped up injections of cash to the financial system, as lenders face a seasonal liquidity squeeze complicated by an oncoming U.S. Federal Reserve rate hike. Asian equity markets traded somewhat mixed after a similar performance on Wall St, where tech extended on gains and the Nasdaq edged fresh records highs, although the DJIA underperformed amid weakness in energy and financials. ASX 200 (+0.5%) was positive with gains led by miners after recent upside in metal prices and with BHP also higher due to interest in its US shale assets, while better than expected GDP data also contributed to the upbeat tone. Elsewhere, Nikkei 225 (+0.4%) eked modest gains amid a weaker currency but with upside capped as wage data added to the recent slew of disappointing releases from Japan, while Shanghai Comp. (flat) and Hang Seng (+0.5%) were mixed as trade uncertainty lingered. Furthermore, the PBoC refrained from reverse repo operations and instead opted to inject via its Medium-term Lending Facility, while there was also speculation PBoC is likely to lift rates on its lending facilities and reverse repos should the Fed hike as expected next week. Finally, 10yr JGBs were subdued amid weakness in USTs and modest gains in Tokyo stocks, while the BoJ Riban announcement was largely ignored as the central bank kept purchase amounts unchanged in 1yr-10yr maturities. China may reduce RRR and increase yields on MLF and reverse repos. European equities are mixed (Euro stoxx 50 flat) with the energy and material sector outperforming following higher commodity prices. FTSE 100 (+0.26%) is the leading bourse being supported by energy and material names. FTSE MIB (-1.0%) currently underperforming bourse and being weighed on by Italian banks (-1.6%) following Conte setting Italy on a collision course with the EU Tuesday. In individual stock news Schindler Holding (+5.6%) is seeing positivity following an upgrade to buy at Goldman Sachs. WH Smith (+5.67%) is also up on the day following positive earnings results. RBS (-0.75%) is down on the day following the announcement that the UK government may further divest from the co. in September of this year. In FX, EUR was the biggest mover as the single currency has extended gains made late yesterday on the back of hawkish ECB sourced reports about a live policy meeting next Thursday, as no less than 3 GC members essentially confirm that the next stage of the exit strategy will be on the agenda. Eur/Usd has tripped stops at 1.1755 to trade just short of 1.1770, but may be hampered by decent option expiry interest between 1.1750-60 (1 bn) and almost double that amount at the 1.1800 strike (1.8 bn). AUD: Off overnight peaks vs its US counterpart, but firmly back above 0.7600 after Tuesday’s sharp pull-back (on a gaping Aussie current account deficit and still neutral RBA) as Q1 GDP surpassed expectations and broad risk sentiment improves on latest global trade reports (including China offering to buy around Usd70 bn worth of US goods). CAD: Another relative reprieve for the Loonie after NAFTA and data disappointment amidst reports that US Treasury Sectretary Mnuchin attempted to persuade President Trump to give Canada a steel and aluminium pardon. Usd/Cad has retreated to the mid 1.2900 area from around 1.3065 at one stage yesterday ahead of several releases slated for today, like trade, building permits and the Ivey PMI. CHF/JPY: The Franc is holding off recent lows vs the Usd with some support gleaned from firmer than forecast Swiss CPI, but Usd/Jpy has climbed above 110.00 in wake of yet more disappointing Japanese data that will keep the BoJ in full QQE mode. DXY: Given all the above, 94.000+ status has been relinquished again and the index is only just keeping its head above 93.500. In Rates, ECB officials, including the more pragmatic Praet, plus hawkish Hansson, Weidmann and Knot seem to be confirming source suggestions that next Thursday could well be another crucial policy convene in terms of conveying to markets the next phase of policy normalisation. Hence, Bunds have come under renewed pressure after a fleeting rebound to a fresh Eurex peak at 161.32, which could have been BTP-related or on more June-September rolls, and have now extended losses to 93 ticks at 160.52, while Euribor futures are as much as 4.5 ticks in the red. Elsewhere, and in the absence of anything major on the UK front ahead of a 2023 Gilt tap and BoE commentary, the 10 year Liffe benchmark and Short Sterling contracts are largely following suit with the former flitting between 122.25-68 vs yesterday’s 122.84 settlement price and the 3 month strip down 4 ticks at worst. Back to supply, German Bobls drew better demand than the 5yr DMO tap (see headline feed for further details), but cored debt futures knee-jerked to fresh intra-day lows amidst hedge unwinds, at 131.30 on Eurex and 122.21 on Liffe. Commodities are mixed with Brent (+USD 0.4) and WTI (-USD 0.2) as prices come off recent highs after nursing recent losses with overnight gains post-API, which showed a larger than expected draw in crude stockpiles. Nonetheless, the inventory report pressured RBOB after a significant build in gasoline stockpiles, although this was then gradually pared throughout the session. Overnight Russia’s Energy Minister Novak reiterated OPEC+ countries should consider a possible easing of oil output restrictions depending on demand conditions. Elsewhere, gold is trading marginally lower albeit still rangebound and currently testing USD 1295/oz to the downside. Meanwhile, Chinese iron ore futures rose to 2-week highs amid an explosion on Tuesday at an iron ore mine in China’s north-eastern province of Liaoning. LME base metals are performing well with LME 3-month copper rising as much as 0.8%, its highest since late February, while LME aluminium climbed to its highest since May 10th earlier in the session. Looking at the day ahead now where it’s a very quiet one for data with Q1 nonfarm productivity and unit labour costs (final revisions) and the April trade balance in the US the only releases of note. Elsewhere, the ECB’s Praet, Knot, Hakkarainen and Angeloni as well as BoE’s McCafferty are due to speak at various stages through the day. Meanwhile, the EU banking authority Chairman Enria and Bank of Portugal Vice Governor Ferreira will also speak at a conference on supervision and regulation of the financial industry. It might be the hangover effect from last week or a bit of a lull in the calendar ahead of the Fed and ECB next week but whatever the reason, markets haven’t really got going this week. A combination of NAFTA headlines, the speech from new Italian Prime Minister Giuseppe Conte and some pressure on Oil prices meant markets stalled a bit yesterday but it was hardly a run for the hills situation as the S&P 500 did still manage to bat on to a small +0.07% gain after European bourses had faded from early highs. The Dow finished -0.06% lower although the Nasdaq (+0.41%) and Russell 2000 (+0.68%) bourses continue to shrug off any attempts to slow them down by climbing to yet another all-time high. Just on those NAFTA headlines, what got a bit of airtime yesterday was White House economic advisor Larry Kudlow’s comments in an interview with Fox News saying that President Trump’s preference was to “actually negotiate with Mexico and Canada separately”. The read through being that the US was therefore seeking bilateral NAFTA talks which in theory would mean leaving NAFTA. Although Kudlow was also quick to point out that the President doesn’t plan to quit the Agreement. As DB’s Alan Ruskin noted yesterday the issue here is the disruptive back and forth rather than the negotiating position itself. This also means trade uncertainties have the potential to linger for a while longer if Trump chooses to go country to country. As for Italy and the new Prime Minister’s speech, the BTP market was already pretty weak going into Conte’s speech but did then proceed to sell-off a little more after he spoke. By the closing bell 2y yields were +27.7bps higher and 10y yields +26.6bps higher. To be fair it’s getting harder to judge what a ‘big’ move is in the BTP market now given that the average daily change in basis points over the last 7 sessions for 2y BTPs has been 65bps. In contrast 10y Bund yields were -5.1bps lower yesterday (the spread to BTPs therefore widening 30bps and for the first time since last Tuesday). Treasuries ended -1.5bps lower at 2.929%. In terms of the speech itself, to be honest it didn’t appear that Conte was overly controversial. Indeed there was talk of reducing the current huge public debt burden and also focusing on economic growth pursued within a framework of financial stability and market trust. There was no mention of the single currency or pension reform although the nervousness in the bond market was likely more a factor of calls for a citizen’s income for the poor and curbs on immigration which, while not new, attracted unsurprising headlines. So with bond markets hypersensitive at the moment that was probably enough for investors to take some profits on the recent BTP rally. The FTSE MIB also turned an early +0.83% gain into an -1.18% loss by the end of play, dragging the likes of the IBEX (-0.66%) lower while the DAX (+0.13%) also closed off its early highs. The Euro spent most the session lower but bounced back to a +0.16% gain in the evening following a Bloomberg headline suggesting that the ECB was viewing next Thursday’s monetary policy meeting as a “live” meeting for debating the end of QE. To be fair that didn’t feel like particularly new news. As noted at the top weakness across the Oil complex was also a factor yesterday, notwithstanding a bit of a bounce back in the evening. Brent ended the session marginally up and just north of $75/bbl (+0.12%), although was down as much as -1.97% at its lows intraday. This followed the news that the US government had supposedly asked OPEC to increase supply by 1 million barrels a day according to Bloomberg. 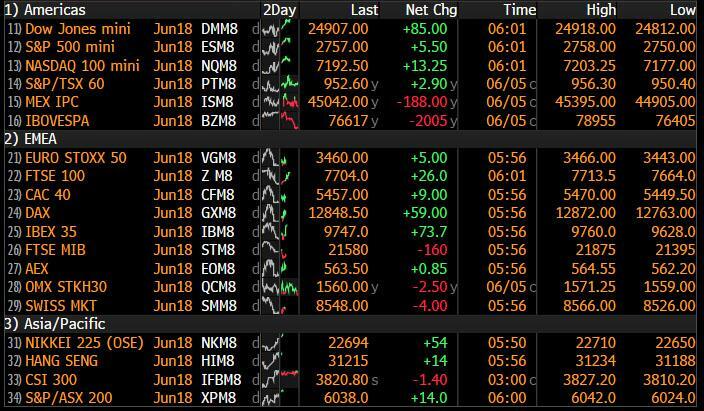 This morning in Asia, various trade related headlines are helping to support small gains across risk assets with the Nikkei (+0.23%), ASX (+0.45%) and Hang Seng (+0.37%) all up. Just on those headlines, the WSJ reported that China has offered to buy up to $70bn of US farming and energy related products if the US abandons its tariffs plans. Later on, unnamed sources clarified to Bloomberg that much of that represent imports China had already promised to buy, so the incremental amount is likely smaller at $25bn. Meanwhile, Reuters reported that Chinese telecoms company (ZTE) has signed an agreement in principle with the US that would lift the ban on buying from American suppliers. The fine is expected to be up to US$1.4bn on ZTE. Finally Treasury Secretary Steven Mnuchin has, according to ABC News, supposedly told President Trump to exempt Canada from tariffs on steel and aluminium. That’s helping the Canadian Dollar to rise slightly this morning while US equity futures are also up slightly. the crunch point as one could call it happens later with the EU customs bill where there is greater agreement on staying in the customs union among MPs compared to the multiple amendments on the Withdrawal Bill. Next week’s vote is worth watching however. In the meantime Sterling benefited from a decent bid yesterday versus the Greenback (+0.60% to $1.339) after the May services PMI surprised to the upside at 54.0 (vs. 53.0 expected), which importantly meant it was up 1.2pts from April. That put the composite at 54.5 compared to 53.2 in April and so matching the high this year made back in February. So that should lend some comfort to the BoE following disappointing data of late. As for the other PMIs, in Europe there were no real surprises in the final May services and composite revisions. The Eurozone services reading was confirmed at 53.8 (down 0.1pts from the flash) and the composite at 54.1 (unchanged versus the flash). Composite prints for Germany (53.4 versus 53.1 flash) and France (54.2 versus 54.5 flash) also saw slight revisions from the flash while as for the noncore, Spain’s composite print surprised slightly to the upside after rising 0.5pts to 55.9 (vs. 55.6 expected), while Italy more or less matched expectations at 52.9 but more importantly held steady versus April. Away from that we did get some softer April retail sales data for the Euro area after sales were reported as rising just +0.1% mom (vs. +0.5% expected), albeit offset by upward revisions to prior months. Across the pond, in the US the services PMI was actually revised up a fairly robust 1.1pts to 56.8 which puts the composite at 56.6 compared to 54.9 in April and the highest in over 3 years. Backing the data up was the ISM non-manufacturing print for May which came in 2pts higher at 58.6 (vs. 57.6 expected). Notably prices paid rose to a very solid 64.3 from 61.8, meaning its edging closer to the 2017 seven-high of 65.9. Finally the April JOLTS data, while backward looking, still showed an increasingly tight labour market. The number of job openings rose to a fresh record high of 6.698m (vs. 6.350m expected) with vacancies outpacing the number of unemployed workers. Meanwhile the quits rate remained at its cyclical high of 2.3%.